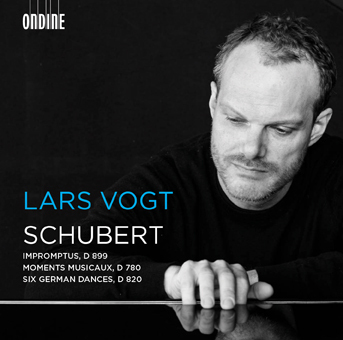 Following Lars Vogt's hugely popular solo debut recording of Bach's Goldberg Variations on Ondine the pianist's new solo recording features much-loved piano works by Franz Schubert (1797-1828). The Impromptus D 899, Six German Dances D 820 and the famous Moments musicaux were written when Schubert was at the height of his maturity and they contain some of his most well-known pieces for the piano. Lars Vogt was appointed the first ever “Pianist in Residence” by the Berlin Philharmonic in 2003/04 and enjoys a high profile as a soloist and chamber musician. His debut solo recording on Ondine with Bach’s Goldberg Variations (ODE 1273-2) was released in August 2015 and has been a major critical success. The album’s tracks have also been streamed online over 6 million times.